LAUDERHILL/USA: California Bears are the new champions of the US Open T20 tournament, as they defeated Somerset Caviliers in the finals of the tournament on Sunday at the Central Broward Regional Park in Lauderhill. In front of a good crowd Bears ran away two-run winners to send the defending champions Somerset Cavaliers away a sad lot. Batting first California Bears made 145 for nine off their 20 overs. After losing a number of quick wickets the veteran Shazan Babwah brought them back into the match with a sober innings. When he started his work, the score was 43/5 and he found a partner in Javelle Glenn. The two worked their magic and got the score up to 94 before Glenn left for 19. He faced 16 deliveries and with the score at the same 94 Babwah was removed for 31 off 33 balls. Former Pakistani fast bowler Najafshah was the pick of the bowlers taking three wickets for 22 runs. His fellow opening bowler Rusty Theron was also good as he took 2/26. Another former Pakistani bowler Muhammad Khalil was also in form taking two wickets for 22 runs. Somerset got off to a good start reaching 37 in just 3.5 overs, as Kennar Lewis hammered the ball. He was first out with his personal score on 32 off 18 balls. Spinner Akeal Hosein who was brilliant in this tournament then sent back the former West Indies opener Xavier Marshall. Opener Gajanand Singh then fell for 23 runs off 29 balls and the wheels started to come off. Towards the end Rusty Theron hit 17 off nine balls but it was not enough to get them over the mark. He man bringing joy for the Bears was former T&T fast bowler Navin Stewart who claimed his best bowling figures in the US Open T20 of 5/15. 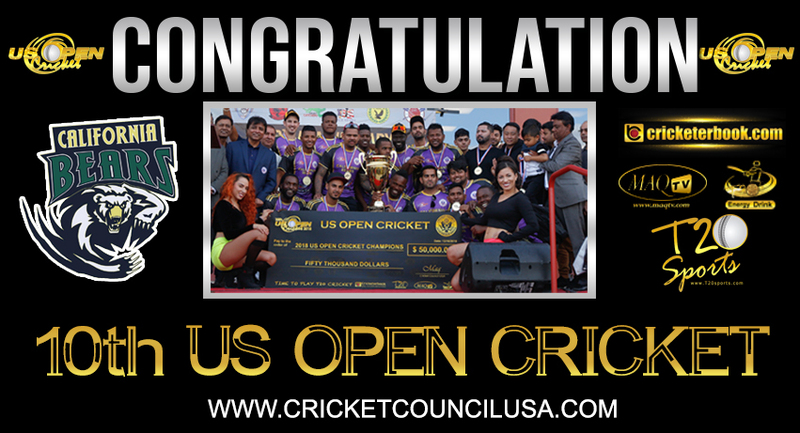 Chairman of CCUSA, Mahammad Qureshi was very happy with the quality of the tournament and said the players did well in promoting cricket in the United States. “We are very happy with the show that the players put on over the last few days and we are looking forward to another great tournament next year. California Bears 145/9 (20) (Shazan Babwah 31, Javelle Glenn 19, Navin Stewart 15no, Akeal Jerome 13, Rusty Theron 4-0-26-2, Syed Najafshah 3/22, Muhammad Khalil 2/22) vs Somerset Cavaliers 143 all out (20) (Ashar Zaidi 37, Gajanand Singh 23, Asad Ghous 17, Rusty Theron 17, Navin Stewart 5/15, Chris Wood 2/20) – Bears won by two runs.